It’s amusing to think that when I work on a large-format piece in bronze or wood it’s termed sculpture but if I do the same piece in plastic on a small scale it’s called a toy. 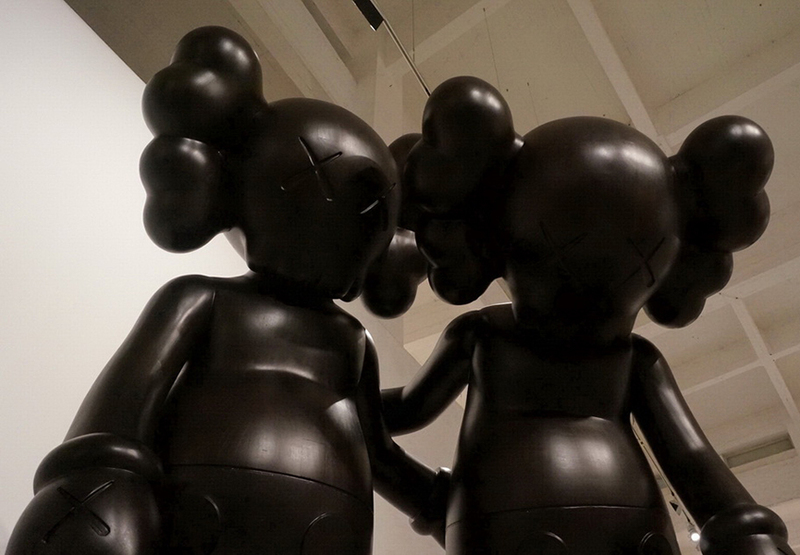 – KAWS. 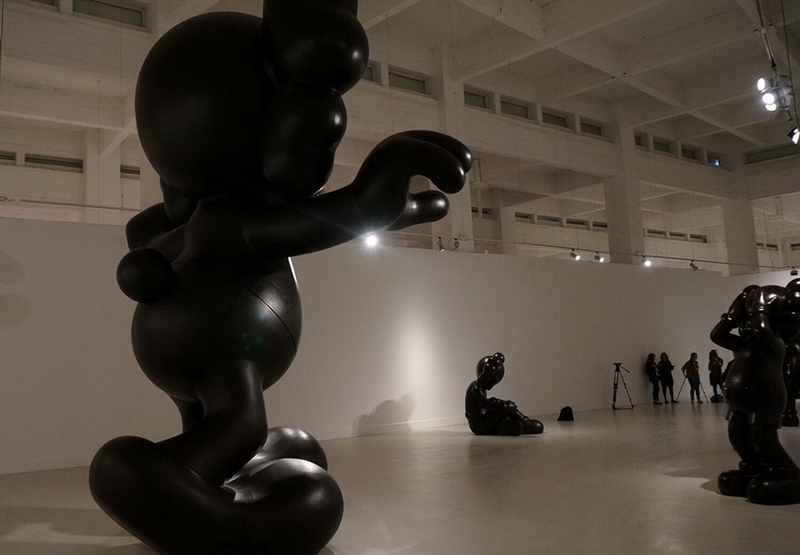 KAWS just opened his big museum exhibition at CAC Málaga. 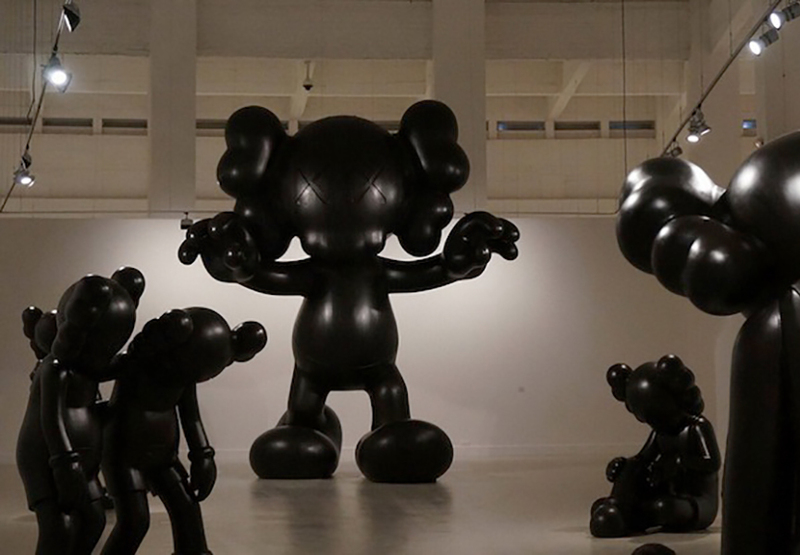 The exhibition, named FINAL DAYS, is designed under the curation of Fernando Francés and presents five large-format sculptures in wood of KAWS’ celebrated Companion, which are among his best known figures, alongside others cartoon characters such as Kurf or Pinocchio. While the Companion relies on the iconography of famous Mickey Mouse, Kurf was inspired by the cartoon Smurfs. Even though both models are iconic pop characters by their own merit, KAWS’ versions have become recognizable pop icons themselves. 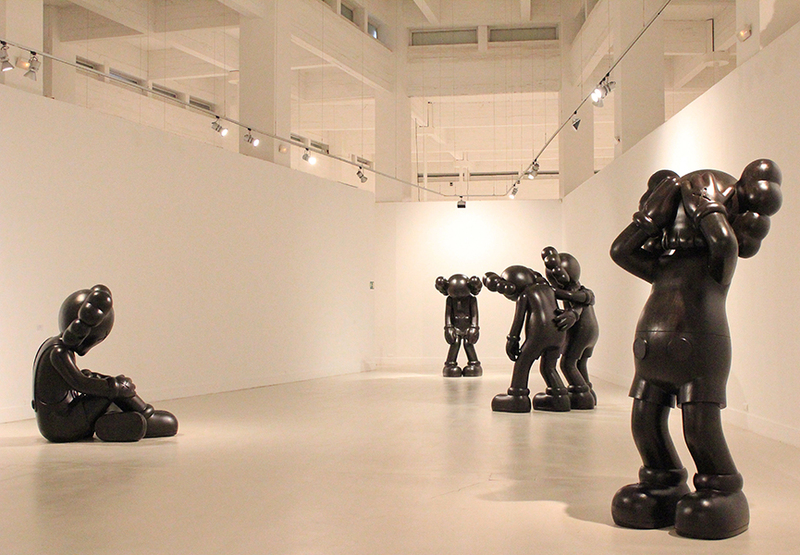 KAWS’ familiar figures will stay on view at CAC Málaga until June 22nd. The works in the present exhibition have never previously been exhibited, incorporating new elements such as the treatment of the wood and a different color range. The six black figures, in various sizes, poses and expressions, exhibited in one large room draw special attention. The centerpiece is a gigantic 6 m tall and 11 ton Kurf sculpture, leaning over the smaller Companion and Pinocchio statues. On occasions KAWS has noted that his characters adopt those poses because they reflect how he would feel if he was continually observed. 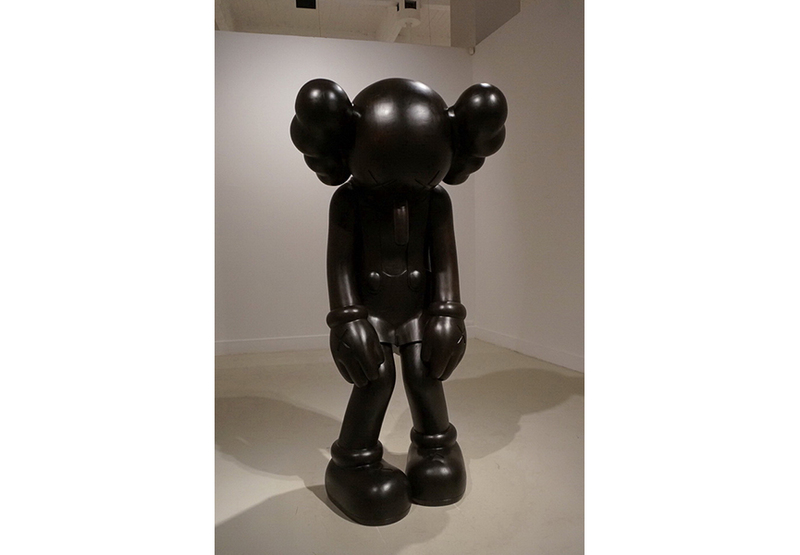 KAWS, aka Brian Donnelly, was born in New Jersey in 1974. He studied Fine Arts at the School Visual of Arts in New York. In 2008 he held his first solo exhibition at the Gering & López gallery in New York. He has exhibited in galleries, art centers and museums around the world, including Galerie Perrotin in . After completing his studies, KAWS went to Japan where he made contact with the emerging Art & Toys movement, based on the collecting of limited edition toys designed and made by artists. Soon after, KAWS became one of the first western artists to start producing art & vinyl toys. His art stands within the historical continuum that began with Pop Art deftly balancing between fine art and consumerism. The CAC Málaga is a cultural initiative of The City Council of Malaga. Its aim is the promotion and dissemination of 20th and 21st Century visual art. The CAC Málaga was officially opened in 2003. It brings new cultural possibilities in the south of Spain. Tthe centre was specifically created with the intention of becoming an international reference point.